Video games can make us feel large and powerful, but they also have the ability to make us very small, granting us a unique perspective on everyday life. Here’s to the games and multiplayer maps that turn us into tiny people in a big, big world. Humanity yearns to explore the dark reaches of space and the depths of the ocean, but there’s another mysterious world hidden in plain sight. What I see as a 10-foot by 15-foot office is a massive sprawling playground to the spiders surely lurking under my desk. And while we possess the ability to fly into the sky or dive deep beneath the ocean, the power to shrink down to insect-size is the stuff of science fiction, kids cartoons and Rick Moranis movies. And video games, of course. Since pixels starting giving way to polygons, game developers have been using their unique medium to cut us down to size. From custom multiplayer maps for first-person shooters that turn kitchens and cupboards into vast battlegrounds, to entire games played from a pint-sized perspective, video games are the best way to explore the relatively massive world around us. Plus, some of us are 6'6" and built like wall dividers. It’s nice to get tiny now and then. Here are some of my favorite examples of games that let us play in super-sized environments. I first saw Air Boarder 64 for the Nintendo 64 in action at the Ascii booth during E3 1998 in Atlanta, Georgia, and I instantly fell in love. As if the idea of riding around on a hoverboard through 3D environments wasn’t cool enough, one of the game’s levels, Big House, was exactly what it sounds like—a giant house. Players hovered about, jumping down stairs, dodging household objects and moving from room-to-room via conveniently-placed mouse holes. It was the coolest thing ever. Sadly, not everyone felt the same way, and the planned U.S. release was scrapped. A kindly PR person from Ascii managed to send me a copy of the Japanese release, and I played it more than any other game on my Nintendo 64. It’s the game that kickstarted my love for giant maps. F.E.A.R. 2: Project Origin was a scary game to play through, but there’s nothing frightening about its free Toy Soldiers map pack. The pack includes a trio of multiplayer maps set in giant-sized versions of locations from the game. The Cockroach map is a bloodied hospital room you wouldn’t look twice at if playing the game at full size. The Recess map takes place in a playground sandbox, where castles crafted by children’s hands become the high ground in a battle between miniature soldiers both real and plastic. But the coolest of the three maps is Full Tilt, which takes place entirely within a pinball table. I spent hours wandering about this map when it first came out, soaking in every detail. Watch all three in action below. You can keep your remastered Nazi zombies, I’ll be winding my way through the abandoned family barbecue that is Black Ops III’s Micro map. I wrote extensively about this map when it came out, more so than any other Call of Duty multiplayer map I’ve ever played on. That’s because there’s just so much to see: beer bottles, hot dogs, cakes and other treats. It’s not just about the cool visuals, but the story this magnificent spread elicits. Where did the people go? What made them abandon what seems like a very well-stocked and well-planned party? These questions and more are pondered below in the video I made last year during my first foray into Micro. Cheating? Maybe a little. Keita Takahashi’s brilliant stuff-gathering game gave us the best of all world-sizes, starting us off as a tiny thing in a tiny place and then giving us the opportunity to grow as large as the stars themselves. It’s the total Ant-Man/Giant-Man experience all rolled up into one (sorry). Note the video below is not my own, but rather one uploaded to YouTube by the PCXS2 emulator folks. This is because I have no good version of Katamari Damacy readily available to record. That should be a crime. This last one goes out to the modders and map builders, who’ve been fascinated with fighting battles on massive maps since making your own levels first became a thing. In Unreal Tournament they called them Giant Maps. In CS: GO they call them Rat Maps. 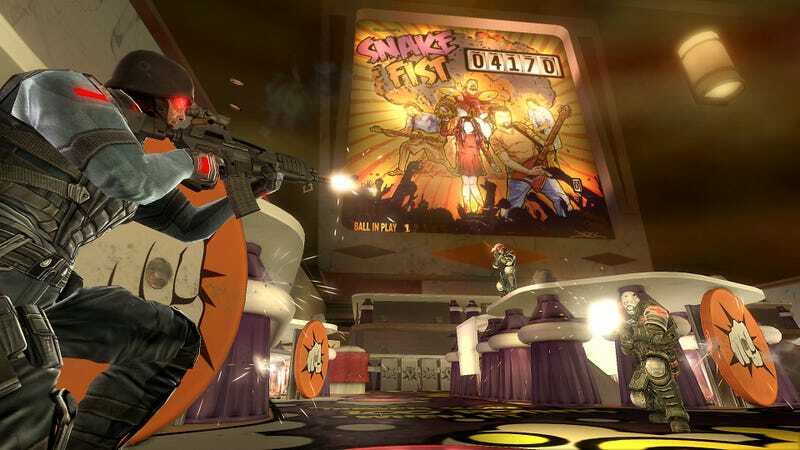 Whatever you call them, there’s something about taking a high-tension online multiplayer shootout and placing it in a massive living room that’s gloriously absurd. There are a ton of Rat Maps available for CS:GO—Steam user Eggerd has compiled a nice collection on the Workshop—but my favorite by far is de_rats_forever2004 by Ol’ ToMoBoBo. It’s got all the fixings. Mouse tunnels? Check. Working toy train? Check. Rideable UFO? Yessir. Desk fans that will kill you? Well, watch the video below and find out. Yes, the desk fans can kill you. This is just a small selection of the wonderful ways video games have shown us how large our small world can get. Share your favorite tiny games in the comments below.